Smart Speed Part 1 | Mediterra - Swim & Run Better Than Ever! In this series of essays I will walk through the process of achieving speed through superior precision, rather than through absolute power. For anyone wanting to improve her triathlon time, expand the distance he can swim with confidence, or improve sprint speed while preserving enjoyment and avoiding injury, these essays are for you. In this first essay I will examine this variable of Stroke Length. Stroke Length is the distance your body moves forward through the water in each propulsive stroke. You can calculate your SL in the pool by dividing the distance you swim by the number of strokes you have taken to cover that distance. In practice swimmers often use units called Strokes Per Length (SPL) which refers to how many strokes taken to reach the other wall of the pool. Keep in mind that Distance in this case is not exactly the distance of the pool (Total Distance) because most of us glide from the wall after push-off for some distance (Glide Distance), then begin stroking. We have to subtract this Glide Distance from the Total Distance to get the actual Swim Distance. Once we have calculated our SL (in meters or yards) we can use this number universally, in any body of water, and compare to other swimmers if we want. SPL, on the other hand, only has meaning when we compare SPL counted in the same pool length (25 meters or 25 yards, for instance), and counted in the same way. Upon discovering the existence, and then the importance of SL, we naturally want to start comparing our stroke count to other’s to get an idea of how we match up. However, Stroke Length is relative to each individual. We cannot just compare my stroke length to your to see who’s is longer, and therefore better, because our goal is not to get the absolute longest SL possible, but discover the OPTIMAL stroke length for your body and for the kind of event you are intending to swim. You can see that the first 4 factors are something you a born with and cannot change, and cannot improve against someone else. However, these features provide you with a certain mechanical capability that is unique to you- these tell you what potential leverage and power supply you have. It is your job to learn to use what you’ve got. In this way, your ‘best’ can be measured by what you can get out of your own mechanical features. Wing-span is the distance from finger tip to finger tip when spreading your arms wide. Our height generally corresponds to wing span, but varies by genetics. For instance, Michael Phelps is 1.93 meters tall (76 inches), and has a wingspan of 2.01 meters (79 inches). I am 1.76 meters tall (69.5 inches) and I have a wingspan of 1.79 meters (70.5 inches). Each swimmer then will have a certain SL range that is appropriate to her genetic features. I have heard it is speculated (like in this Popov video) that, under maximum effort, a swimmer’s SL cannot exceed her height (or more specifically, her wingspan). Therefore, the maximum SL a swimmer can achieve under one of her own propulsive strokes is 100% of her wingspan. I can think of good arguments from human kinetics and hydrodynamics that support this speculation. So let’s go with this assumption for now. I am in awe of Sun Yang’s 1500m WR performance 31 July, 2011. He set a new high standard for efficiency at medium distance. From my review of this race I estimate that he swam 1400m of that race with 28 strokes per 50m (at an average 58 seconds per 100m!) at an average SL of 1.61m. Considering his wingspan to be 2.11 meters (he is 1.98 meters tall), his stroke during this swim was held at about 76% of his wingspan. That is an extraordinary percentage of wingspan to maintain for 1500m, even without noting that it was a world record performance. At this point I think he sets the high mark for what we might aim for in our own SL capabilities at medium distance. In this chart I have set the parameters at strokes taken in 20 meters, as if we were swimming in a 25 meter pool and all of us were pushing off the wall, gliding 5 meters then beginning our stroking. SL is calculated by taking our swim distance of 20m and dividing by SPL, which assumes we all are counting strokes in the exact same way. For instance, at SPL of 12, Stroke #0 is begun at the 5 meter mark, and we touch the wall at #12. With what I have studied so far I anticipate that we will find our optimal SL within 55% and 75% of our personal wingspan. And as we feel some aging come on, we may give ourselves some grace as well and be a bit more generous on those percentages- say 50% to 70% or lower. However, we should always work on improving it (moving that percentage range higher from where we are at) because in that pursuit we are specifically doing the neurological and muscular exercises that will hold off the aging process. Wihtin common swimming capabilities and conditions 55% of wingspan would be quite short, and 75% would be impressively long. I have highlighted this region for each swimmer in the chart. You can see how wingspan relates to SL. This chart suggests that I personally aim for an SPL range of 16 to 19 SPL (counting in that 20 meter distance). I know from thousands of hours of practice that my optimal sprint SPL (for 100m for instance) will be around 18 or 19 SPL at sprint tempo, while I will choose 16-17 SPL for most of a calm-water, 1500m event. It is easy to shorten a stroke and very difficult to lengthen it. Since water resistance and distractions are constantly working against my stroke length, it is a normal part of my weekly practice to strengthen my ability to execute long strokes- pushing the 14 SPL end with more difficult balance and streamline exercises. It will require consistent work to move SL into a higher percentage range. A shorter person, like my wife at 1.58 meters tall, will have to work at perhaps superhuman effort levels to achieve a SL like Sun Yang. Even if she was transported back to 19 years old, and held best streamline position, the extraordinary forces she would have to pass through her joints to meet that expectation is a recipe for injury if not mechanically impossible at her wingspan and power capabilities. 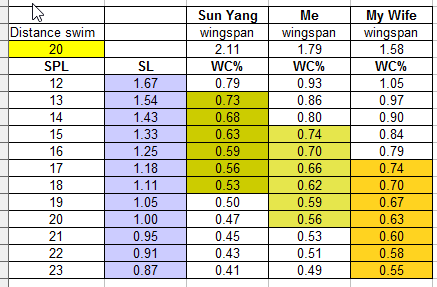 A person of my wingspan may be capable of achieving Sun Yang’s stroke length, but again, I would either need to slow the tempo, or increase the force passing through my joints to a dangerous level to match his tempo. Not impossible perhaps (for at least a length or two), but very risky as I had learned the hard way when I was his age. So I am pursuing that upper end of my Stroke Length capabilities with much more wisdom on hand than there used to be. Therefore, I will examine more aspects of this speed equation in following essays, and ultimately land on the ‘secrets’ to pursuing speed through precision, whether the goal is to set personal records or increase enjoyment.